Showing 37 articles from December 10, 2014. LOUISBURG -- The state's drafted blueprint for road construction and improvements doesn't include U.S. 401 in Franklin County in the near future. As recently as 2010, N.C. Department of Transportation's (DOT) 10-year plan called for widening U.S. 401 from N.C. 96 to Flat Rock Church Road in 2017. Don't look surprised, there is a reason Santa is popping up all over Franklin County these days, especially in parades. Christmas is just two weeks away and he's making those final "who's been naughty and who's been nice" checks. 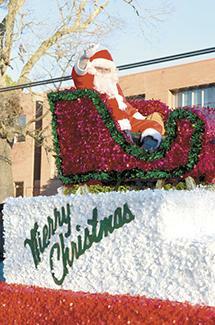 The jolly old gent is shown here in Louisburg's Christmas parade and photos from all five Franklin County parades will be appearing in editions from now until Dec. 24. LOUISBURG -- A recently retired, veteran Franklin County educator had some carefully chosen words of advice for the county Board of Education Monday night, urging them to not "forget the wisdom and expertise" of those already in the school system. But following its tradition, the school board did not respond to the comments -- or even ask questions. LOUISBURG -- The Franklin County Board of Education took a few minutes to get organized Monday night -- but in the end, nothing changed. Prior to the start of the meeting, four members took new oaths of office after being re-elected in November running unopposed. 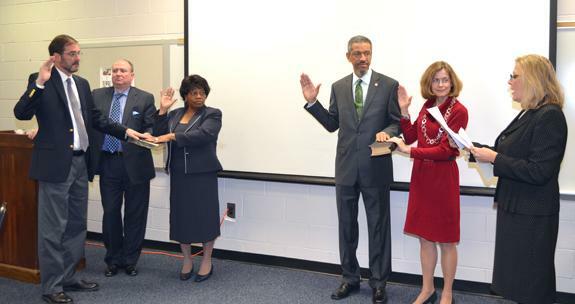 Sworn in were Gilbert Johnson, Dr. Elizabeth Keith, Bernard Hall and Paige Sayles. OPEN HANDS. Jerri Ball, left, shakes hands with Sonny Robbins during a retirement celebration last month. In the background are shop workers Corey Pender, second from left, and Lisa Dickerson. FRANKLINTON -- As a drag racer, Jerri Ball was used to blasting down race tracks all over North Carolina, South Carolina and Virginia. In 2002, his exploits earned him induction into the inaugural class of the East Coast Drag Times Hall of Fame. 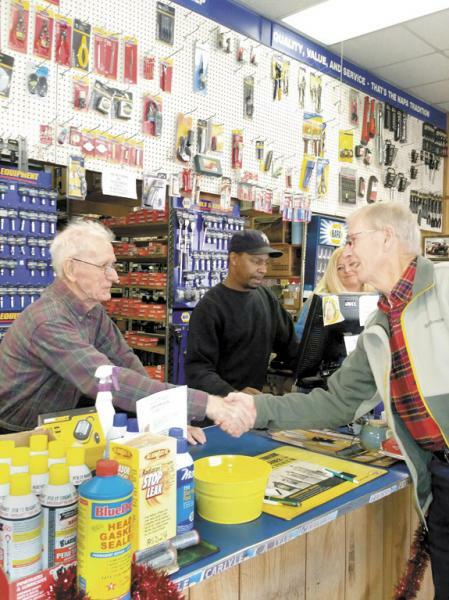 For more than 35 years, though, he was the steady stalwart behind a cornerstone Franklinton business -- Ball Auto Parts. Bad news, like grapes, always seems to come in bunches. But I greatly prefer grapes! The last several days have been bad news central around here, certainly the worst was the state's snubbing of our long-needed improvements to U.S. 401 before someone else dies out there because of state neglect and inaction. 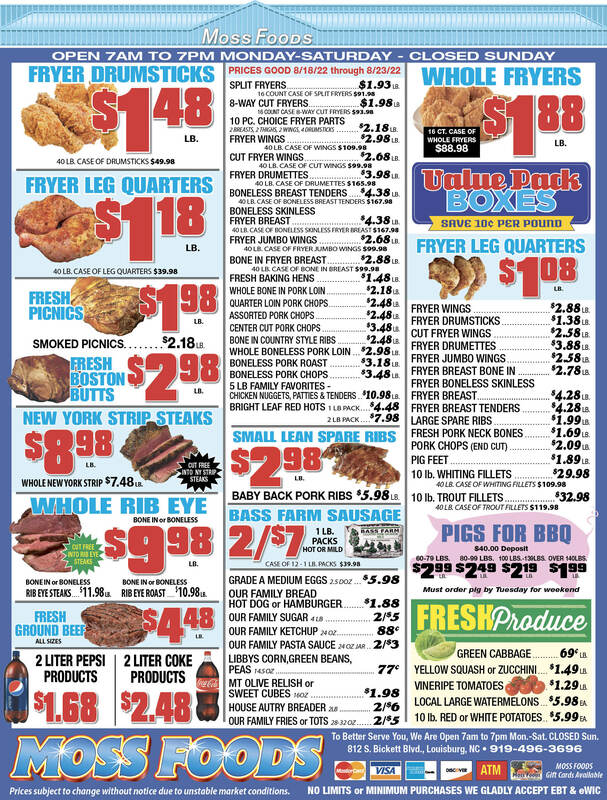 There is lots more information in this edition -- including the editorial on this page -- which will fill you in about the latest in this sad, disgraceful saga. Well, it certainly didn't take long to determine that once again Franklin County residents are the victim of a political shell game. Remember, just before the election when Gov. Pat McCrory and his cronies -- to much hullabaloo -- touted a billion dollar highway funding scheme that would have included the improvements to U.S. 401 in Franklin County that we have needed for decades? Can protesters demonstrate the ability to reach a civil solution? For the past few weeks, demonstrations have taken place across the country as people have taken to the streets to protest grand jury decisions not to indict officers in the deaths of two unarmed men near St. Louis and New York. Significantly, I understand these protests. They serve as a means for people to gather together and express outrage at an action they have issue with -- whether it was the action of the officers in question or the jury of their peers who determined that said actions were not criminal in nature. In a democracy, there is power in an active political movement, even if it only entails a very small portion of the citizenry. 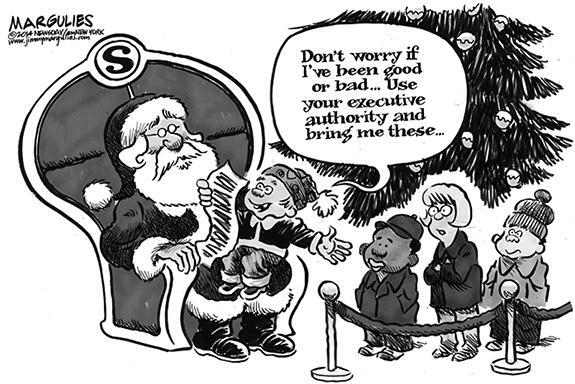 America democracy is very expensive, especially in view of some recent Supreme Court rulings. So if you add the monetary power of a few greedy, self-surviving but well-heeled individuals to that active minority, you have a force. 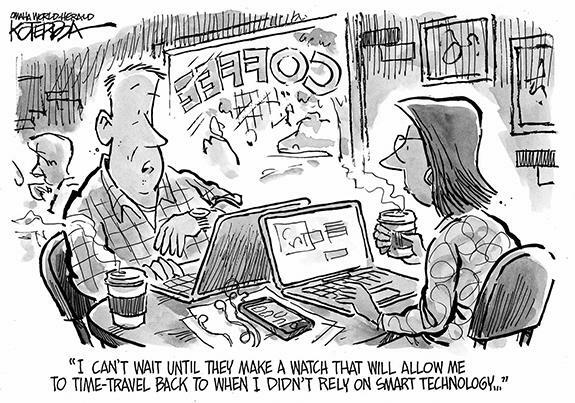 This is what is playing out in American education of late. We would like to take this opportunity to inform your readers that the Franklin County Health Department (FCHD) is a recognized full service critical access provider of preventive and primary healthcare services for residents of Franklin County. FRANKLINTON --Funeral services for Bettie Wright, 43, who died Sunday, Dec. 7, 2014, will be held at 12 p.m. Saturday, Dec. 13, at Haywood Baptist Church, with Bishop Stanley Hicks officiating. Burial will follow in the church cemetery. LOUISURG - Funeral services for Eddie "Fever" Burwell, 64, who died Sunday, Dec. 7, 2014, will be held at 1 p.m. Saturday, Dec. 13, at Richardson Funeral Home in Louisburg. Burial will follow in the Manassas cemetery. JAMES R. "WAGON MAN" FOWLER, JR.
LOUISBURG - James Ruffin "Wagon Man" Fowler Jr., 69, died Tuesday morning, Dec. 9, 2014. A funeral service will be held 11 a.m. Friday, Dec. 12, at New Hope Christian Church with the Rev. Steve Barham officiating. Burial will follow in the church cemetery. EYE-CLOSING EXPERIENCE. 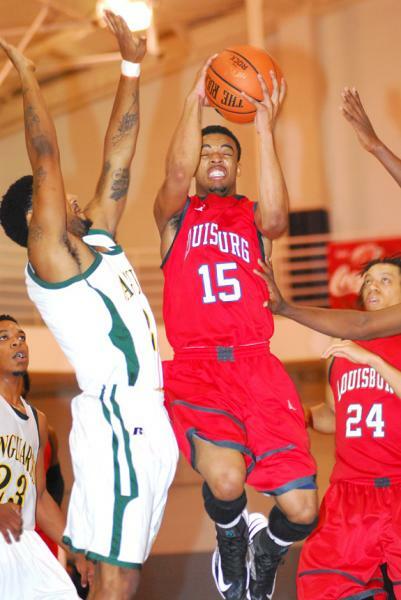 Louisburg College guard Deshawn High (with ball) drives last Wednesday night against rival Vance-Granville CC. HENDERSON -- Vance-Granville never defeated Louisburg College during the short history of the VGCC men's basketball program. And they hadn't even come close, for that matter. Playing at a high level and fired up in front of a Vanguard Night crowd, VGCC gave the top-ranked Hurricanes all they could handle for LC was eventually able to secure a 100-90 decision in a spirited event at the Aycock Recreation Center. GAME IN HIS HANDS. 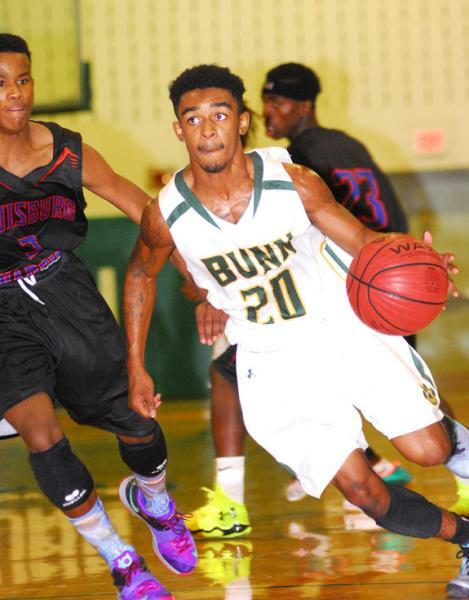 Strong play from T.J. Jones (with ball) helped the Bunn Wildcats secure a home boys basketball victory last Friday night against backyard rival Louisburg at the Bunn Dome. BUNN -- In a rare shift from recent form, Louisburg held the experience advantage heading into last Friday's rivalry boys basketball matchup at Bunn. But BHS had one veteran trump card -- and he would prove to be the difference in the hard-fought event at the Bunn Dome. SECOND SPOT. 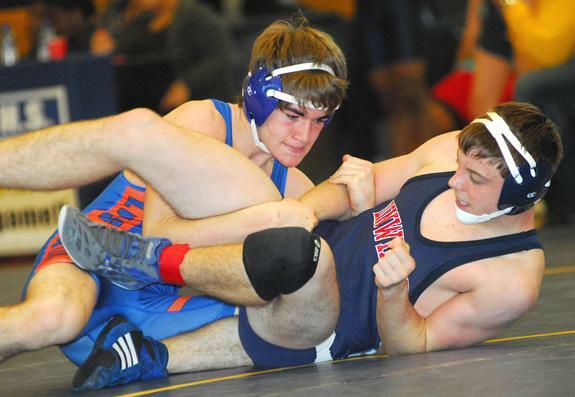 Louisburg's Ryder Bishop (left) took second place in his weight class at the Grant Wilson Invitational Tournament last weekend. ROCKY MOUNT -- Louisburg's Ryder Bishop is ranked third in the state at 152 pounds in his classification -- and he was determined to live up to that billing during last Saturday's action at the Grant Wilson Invitational. Taking on some tough competition at the 12-team event, Bishop reached the finals in his class before settling for the runner-up spot following a tough loss at C.B. Aycock's Josh Wallace. CASH AND CARRY. Nash Central's Montre Cash (right) claims the ball while being defended by Bunn's Brandon Stroud during Tuesday night's boys basketball showdown at the NCHS Gymnasium. 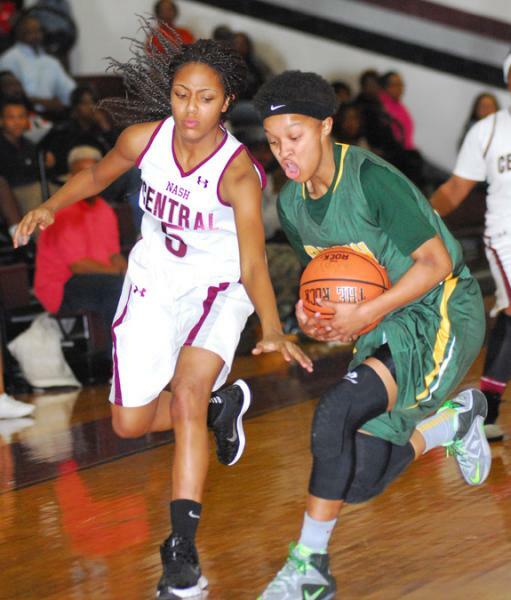 ROCKY MOUNT -- With the outcome of the game in doubt at halftime, the Bunn Ladycats turned to a reliable ally to break open Tuesday's road basketball showdown at Nash Central. Central led by as many as three points in the opening quarter and stayed to within six points of the Ladycats at the break. But Bunn's traditional pressure defense would prove to be far too much for the Lady Bulldogs in the third stanza as undefeated BHS would pull away to earn a 57-35 non-league triumph at the NCHS Gymnasium. 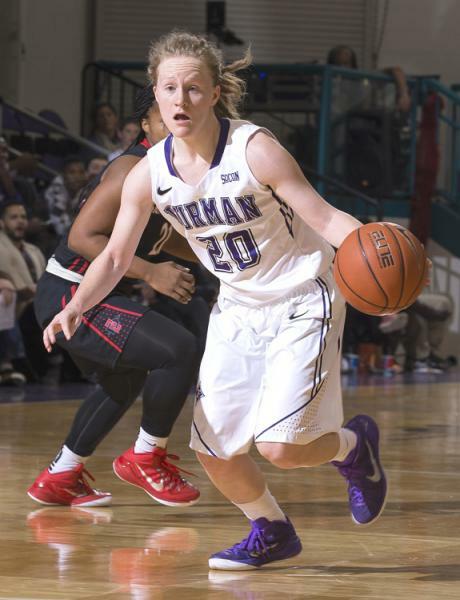 GREENVILLE, S.C. -- Furman University guard Whitney Bunn has been named Southern Conference Player of the Week for her performance in three Paladin victories this past week. 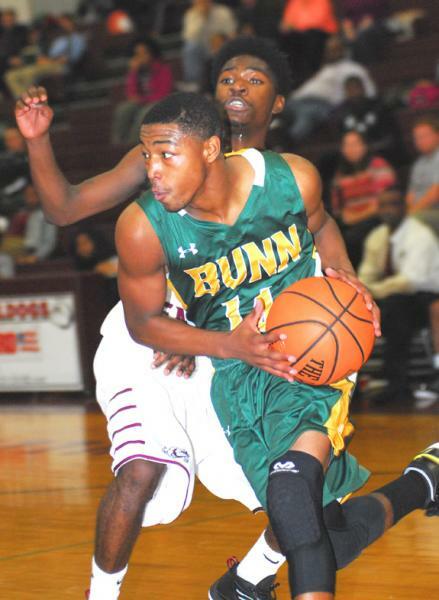 Bunn, a 5-foot-7 sophomore point guard who prepped at Bunn High School, averaged 19.0 points, 4.7 rebounds, and 9.0 assists per game in keying Furman to a 90-56 victory over Coastal Carolina, an 84-79 triumph over Appalachian State, and 75-50 win over North Greenville. LOOSE BALL. 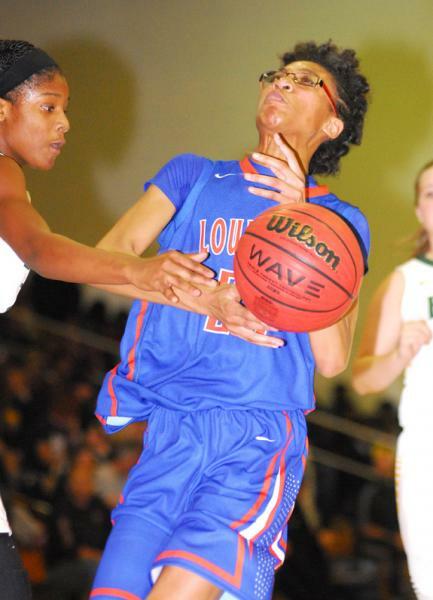 Louisburg's Vanisha Wilshire (right) has the ball knocked away by Bunn's Bernadette Cooke. BUNN -- During his previous stint at Bunn Middle, Mike Sheldon got a firsthand look at the talents of several performers on the current Bunn High girls basketball roster. Shelton was in charge of the BMS boys program at the time before moving on to become an assistant principal at Louisburg. 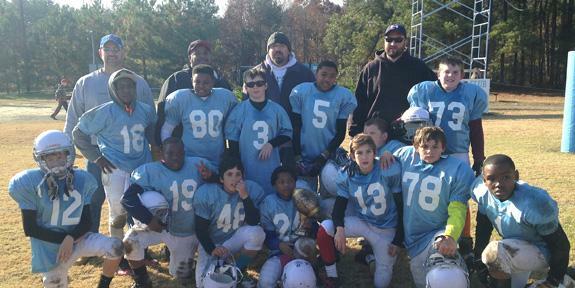 FRANKLIN COUNTY -- The first-year Franklin County Chargers youth football program recently defeated the Wake Forest Alpha Dogs by a 22-7 score in the Carolina Elite State Championship Tournament. The victory capped a strong inaugural season for the Chargers in the 12-under varsity division. Jamie Murray served as the head coach, with Dale Spicer, Durand Mills and Jason Napier helping out as assistants. FRANKLINTON -- Franklinton guard Tanisha Wall scored 20 of her game-high 22 points in the final three quarters to lead the Franklinton high Lady Rams to a 50-41 victory over the Southern Lee Cavaliers last Friday night at the FHS Gymnasium in girls basketball action. The Rams found themselves facing a 36-35 deficit with a little over four minutes left in the game. LUCKY 21. Louisburg College's Ambryia Davis heads into the paint during last Wednesday's win over Tidewater. LOUISBURG -- With their offense still a work in progress, the Louisburg College Lady Hurricanes have turned to the defensive side of the court to embark on a recent four-game victory streak. In their final home game before the holiday break, LC sputtered at times but was able to outlast Tidewater Community College by a 75-62 margin last Wednesday at the Taylor Center. 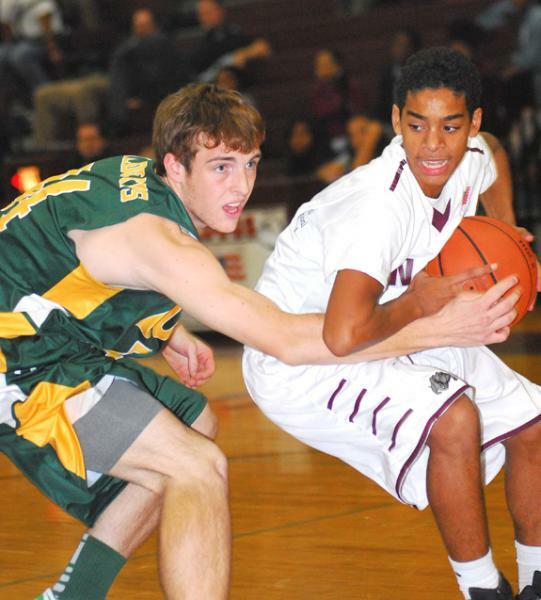 Bunn's Precious Walker (right) comes up with a steal on Tuesday versus Nash Central. 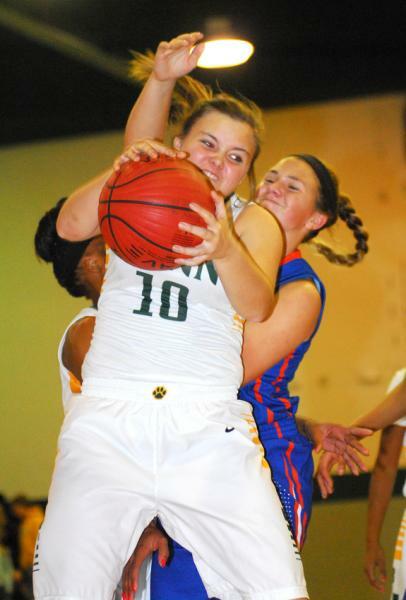 Bunn's Kristy Green grabs a board for the Ladycats. 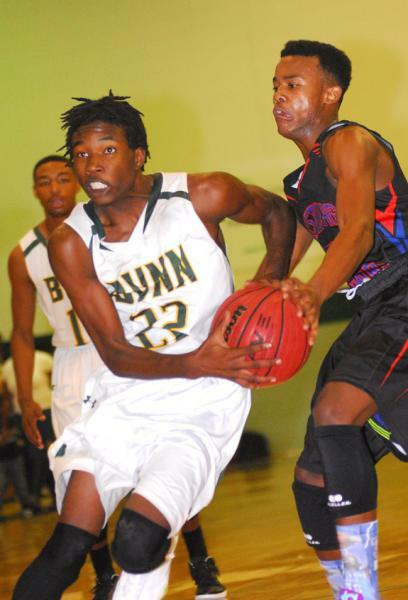 Bunn's Quenten Wright (with ball) is fouled on a drive to the basket on Tuesday. (L to R) Bunn's Darrius Caldwell tries to drive past Louisburg's Tyree Thorne last Friday night. 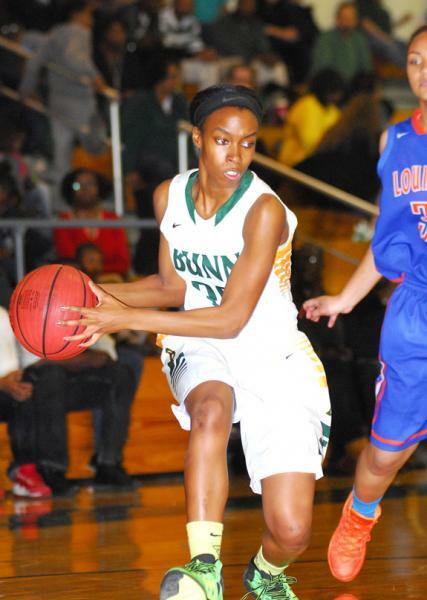 Jonasha Green prepares to make an entry pass for Bunn during last Friday's victory over Louisburg. The Oakwood Waits, an a cappella group from Raleigh, will perform at Cherry Hill Plantation in Inez on Dec. 21, beginning at 3 p.m., and will feature the group dressed in antebellum costume for the seventh year. 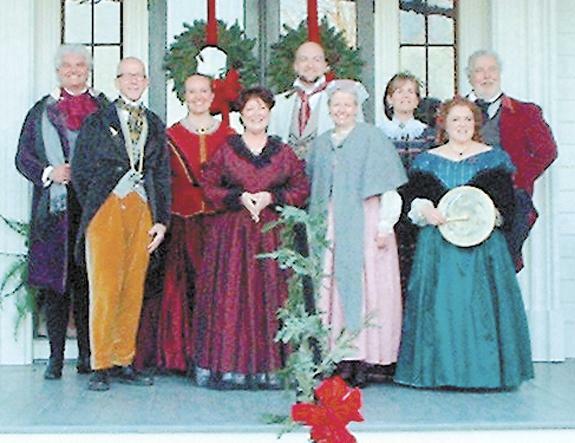 The performance of traditional carols and songs has been given from the Executive Mansion to the White House and has become a holiday tradition at the 1858 home of the Alston family. The Franklin County Sheriff's Department has issued a warning for anyone buying lumber to be on the lookout for both vintage heart pine and newer lumber that was stolen earlier this week from a local restoration site. If anyone is contacted about purchasing the lumber, they are asked to call the Sheriff's Department immediately -- and if the tip leads to an arrest and conviction of the thieves, a $1,000 reward is available. 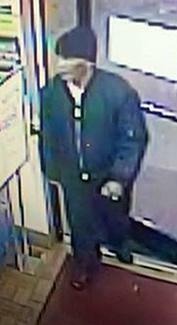 ALERT -- Franklin County sheriff's deputies are looking for suspects involved in a shooting during a birthday party. According to authorities, a parent was hosting a birthday party for a 16-year-old on Ayscue Lane when two different groups of people showed up at the Dec. 6 event. Between 9-10 p.m., authorities said, an apparent altercation occurred outside and shots were fired. 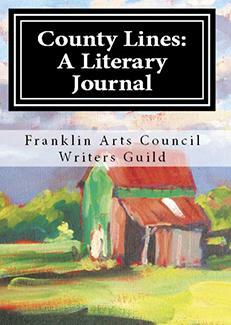 Franklin County Arts Council's Writers Guild has published its second edition of County Lines: A Literary Journal. Twenty-four writers and artists contributed to the 2015 issue with poems, essays, short stories and art in the 136-page book. The editorial staff was made up of six guild members: Jackie Dove-Miller, Donna Campbell Smith, Maureen Buck, Audrey Boyd, Michael Nelson, and Deana Vassar. Army Pvt. Ethan K. Smith has graduated from Basic Combat Training at Fort Benning, Ga.
During the nine-week training period, Smith received instruction in drill and ceremony, weapons, rifle marksmanship and bayonet training, chemical warfare, field training and tactical exercises, armed and unarmed combat, military courtesy, military justice, physical fitness, first aid, and Army history, traditions, and core values. 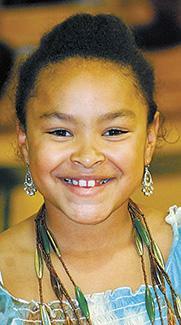 LOUISBURG -- Liz Guzman hasn't celebrated a great Christmas since 2010. 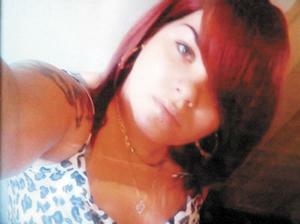 That's because just weeks before Christmas in 2011, her daughter, Rosemarie Guzman, was killed in a murder-suicide. But after starting Domestic Violence Coalition 24 -- a resource that helps survivors of abuse that Guzman began to honor her daughter's spirit -- she said she's ready to celebrate the season again. 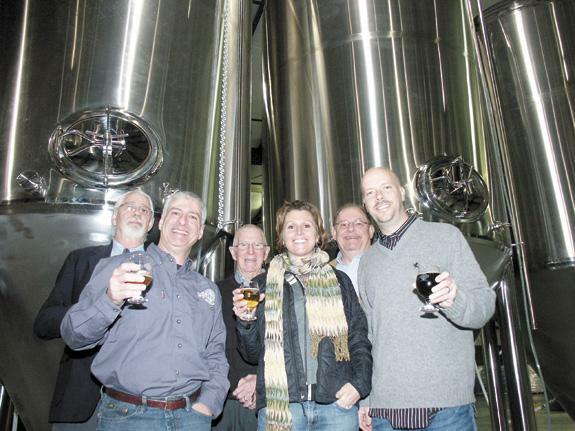 White Street Brewing Co. owner Dino Radosta, second from left, held an open house last week at the warehouse and distributorship he is planning to have fully operational by year's end. He was joined by, from left, Youngsville Town Administrator Bill Tatum, Youngsville Commissioners Graham Stallings, Cat Redd, Terry Hedlund and Mayor Fonzie Flowers.